Sixty photographers have work in the Griffin Museum of Photography’s “20th Juried Show.” The show runs through Aug. 31, as do “Sentiment: Photographs by Rafael Soldi” and “Her: Photographs by Marjorie Salvaterra,” also currently at the Griffin. Each of the 60 has just one photograph on display, which puts a premium on immediate impact. In accompanying statements, many of the photographers describe a larger series or body of work their image belongs to. But except for those viewers willing to do some reading, what you see is what you get. That can be memorable. Clare Carter is the winner of the juried show’s Peter Urban Legacy Award. Urban, a well-regarded Boston commercial and fine art photographer, died in 2009. In a gracious touch, the show includes five of his diptychs. The one with a naked man swinging a baseball bat is pretty funny. It’s not hard to see why Carter’s “Lindeka Stulo, Guguletu, Cape Town” won. Really, there’s no polite way to say this: Good as many of the other images are, it blows off the walls everything else in the gallery. Stulo’s face really is that extraordinary. It’s a reminder of how art, wondrous as it might be, can never surpass the wonder that is another human being. The image’s power is even greater when one reads Carter’s account of how Stulo was brutally assaulted, twice, by a man enraged by her lesbianism. K.K. DePaul’s assemblage “Between the Pages” manages to combine tactility with a sense of time’s passage. The boots in Greg Sand’s “Vestige #9” are definitely not made for walking. But that’s all right, such is their homely, forthright beauty. The solo row house in Ben Marcin’s “Camden, NJ” looks simultaneously noble and ignoble, like an old man who stands erect despite his decrepitude. The luridness of the shade of green in Brad Carlile’s “Deec” — think limeade laced with gangrene — has to be seen to be disbelieved. Androids may or may not dream of electric sheep. But if dream they do, this is what the green in those dreams must look like. Odd, and oddly pleasing, visual relationships emerge. Could the wallpaper in Frances F. Denny’s “Hope, guest room (Mt. Desert Island, ME)” have been bought at the same store as the wallpaper in Stephanie Kaznocha’s “Gloucester, Massachusetts, Mr. and Mrs. Joseph Lopez”? What counsel might the Lopezes have to offer another couple, the one in Martha Fleming-Ives’s “After the Fight”? Even a Wallace Stevens fan, understandably partial to Susan Keiser’s “A Mind of Winter #9,” might concede that Katrina d’Autremont’s “Margo and Eloise Among the Cows” has the best title. Certainly, it has the most startlingly literal. Speaking of startlingly literal titles, Yijun Liao’s “Home-made Sushi” shows her boyfriend trussed up on a mattress looking like a piece of same. Hold the wasabi. Everybody knows someone who’s been through a bad breakup. Most everybody knows someone who wouldn’t stop talking about it. Rafael Soldi wouldn’t stop photographing about it. “Sentiment” consists of 13 photographs. (Is the number deliberate?) They’re in color and biggish: either 24 inches by 30 inches or 16 inches by 20 inches. So they’re not unassertive. There’s no doubting the intensity, or nakedness, of feeling. But the very overtness makes them cumulatively creepy. When Soldi works more obliquely — a close view of a scrap of paper burning; two postcards on a white background; a crumpled road map, with the title “I’m Here, You’re There” – the work is visually striking, witty, and all the more affecting for that wit. 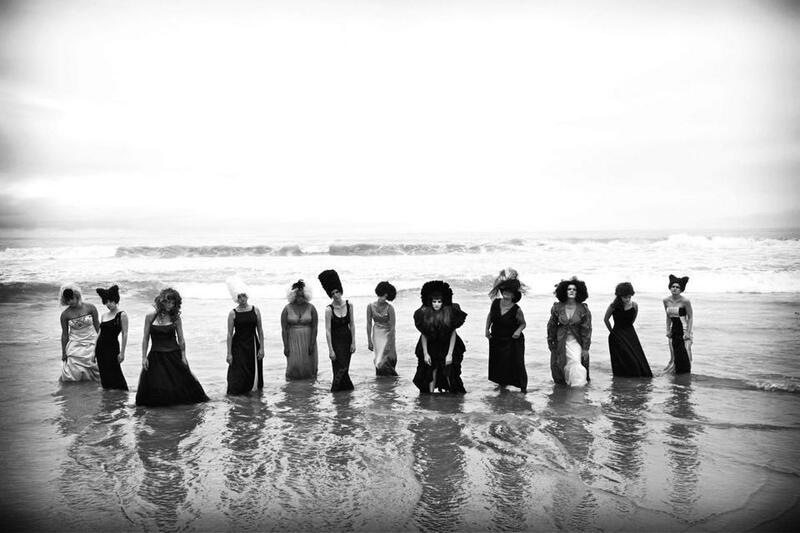 The 13 black-and-white photographs in Marjorie Salvaterra’s “Her” are feminist ripostes to what remains an obliviously anti-feminist society. A woman is made up to look like a mannequin. A group of women form a kind of chorus line — only they’re standing in shallow water. Another group of women, in little black cocktail dresses, stand outdoors, their faces obscured by umbrellas. There’s an all-female “Last Supper.” That Leonardo of ladies is even funnier than Urban’s naked ballplayer (maybe he could wait on the table?). Distinctive as these pictures are, they soon become repetitive. Cleverness is doing the work of feeling. It’s the reverse situation from Soldi. Maybe the two could collaborate.